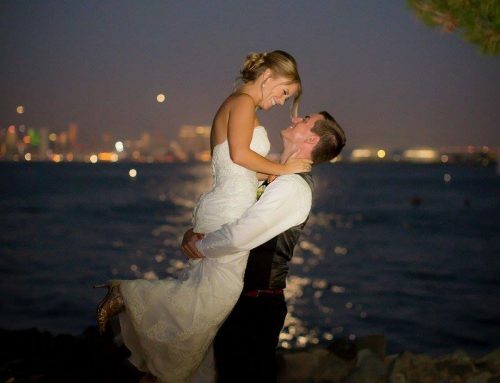 About seven months prior to their wedding, Amy and John contacted us for help with the key details of their big day. 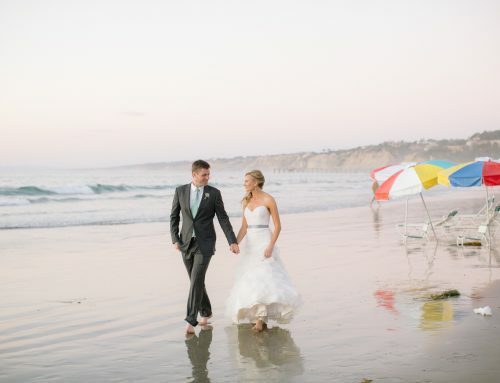 From the beginning, they wanted a beach wedding with an elegant feel. When they discovered the Scripps Seaside Forum, they knew it was a perfect fit! We immediately began working closely with the couple, as well as and Amy’s mom, Nancy. Throughout the process, we provided planning assistance, vendor recommendations, design support, time and budget management, and layout development for this gorgeous wedding. When the day finally arrived, John looked dapper in his bow-tie. Amy was breathtaking in her floral embellished wedding gown. One of our favorite moments of Amy and John’s day was seeing them meet for their “First Look.” There’s always so much anticipation leading up to this happy moment, and we were honored to be a part of it. John’s groomsmen had such a fun (and irreverent) sense of humor! Each member of the wedding party added to the comfortable feel of the day! A beautiful canopy, gave a romantic beach flow to the ceremony. The overhead market lighting added a cool, outdoorsy vibe. Inside the Forum, we draped the back wall and added uplights, giving a soft romantic feel to the room. For an extra personal touch, guests were presented with mini picture frames, which served as their table place card holders. Guests were encouraged to take these frames home to help remember the special day. Once the sun set, we turned on special spotlights that shot out toward the ocean. These lights made the coastline visible in the dark, and allowed for great photo opportunities. Best wishes to Amy and John as they start their new life together! Beautiful! Who did the bride’s hair/makeup for the day please? Beautiful wedding! And the bride’s hair is lovely… can you tell me who her stylist was? Thank you!